Hurricane Patricia causes flooding in Texas and Louisiana. 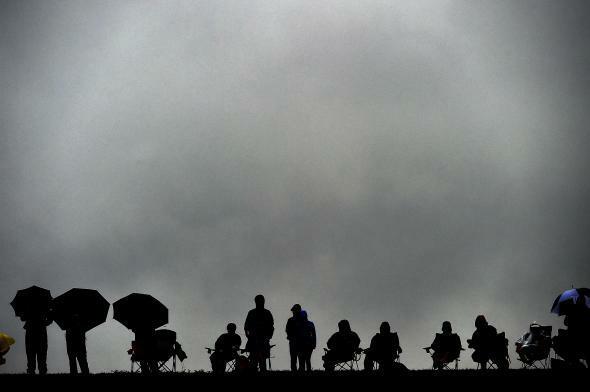 Spectators brave the rain to watch the qualifying session ahead of the the U.S. Formula One Grand Prix at the Circuit of the Americas in Austin, Texas, on Oct. 25, 2015. After crossing Mexico over the weekend, what’s left of Hurricane Patricia—at one point the strongest hurricane ever measured in the Western Hemisphere, but vastly diminished after making landfall on Friday—has contributed to a widespread flooding event in Texas and Louisiana. After hitting late Friday in a secluded and sparsely populated region of Mexico’s Pacific coast, Patricia’s winds weakened quickly as its center passed over the rugged mountains of Mexico’s continental divide. The brunt of the damage was done to poor communities that may take months to recover, but Patricia caused few casualties. The bulk of Patricia’s moisture (as well as its midlevel atmospheric spin) remained largely intact as it crossed the country and emerged off the coast of Texas late Saturday. An intense surface low pressure center reformed in the Gulf of Mexico on Sunday, bearing winds of tropical storm force, though the National Hurricane Center didn’t deem it to be organized enough to call it a tropical storm. As of Monday morning, what’s left of Patricia has moved inland in southern Louisiana. In Texas, heavy rains fell nearly statewide throughout the weekend. At one point early Sunday, the entirety of downtown Houston was closed off due to high water. The heaviest rains fell near Dallas, where one stream rose 30 feet in less than a day to the second-highest level ever measured. Flood waters in the Dallas area were strong enough to derail a freight train, whose two-person crew was forced to swim to safety. In Houston, more than a foot of rain fell, and strong offshore winds grounded an oil tanker near Galveston Island. Similarly heavy rains hit southern Louisiana on Sunday: The 8.67 inches of rain in New Orleans was the city’s fourth-wettest day in history, including hurricanes. In a coincidence, the meteorology of this weekend’s Texas floods is similar to the heavy rains that deluged much of South Carolina earlier this month, generated from a “predecessor rain event” as a hurricane’s energy was absorbed into a pre-existing frontal system. In this instance, the remnants of Hurricane Patricia contributed to a record-moist atmosphere over south Texas this weekend, making the flooding across the state more likely. Heavy rain is in the forecast across much of the eastern United States through Thursday as the remnants of Hurricane Patricia move eastward. These sorts of rainfall events can quickly overwhelm, though this weekend’s Patricia-enhanced flooding doesn’t initially seem as damaging as another one-two flooding punch earlier this year in the same parts of Texas. Texas’ “flash flood alley,” a region of hilly terrain between San Antonio, Dallas-Fort Worth, and Houston that features frequent heavy rainstorms and a rush of urbanization in recent decades, is one of the most vulnerable parts of the country when it comes to flooding. Patricia swiftly disintegrated after initial landfall for much the same reason that the swirl in your morning coffee chaotically comes to a rest once you stop quickly spinning the spoon—Patricia’s core vortex was disturbed by Mexico’s rugged landscape. Inexplicably, Patricia’s dramatic strengthening and equally fast demise also gave fuel to climate change deniers on social media. The weird logic behind the furor: Since Patricia weakened so quickly after landfall, therefore its unprecedented strength hours earlier can’t be connected to climate change. Actually, it’s perfectly normal for an intense hurricane like Patricia to quickly weaken after landfall—especially if it plows headlong into a mountain range—and, as I wrote on Friday, there are several reasons to expect extreme hurricanes like Patricia more frequently over the coming decades as the planet warms. Patricia’s remnants will join forces with a storm system currently over the Great Lakes to provide a multiday round of rainfall for most of the eastern part of the country this week, reaching the East Coast by Wednesday or Thursday. Another round of Texas flooding—with another several inches of rain—may be on the way later this week, just in time to create a soggy Halloween in the Lone Star State.